this information has been compiled to apprise employees and the public of the availability and location of appropriate auxiliary aids and disability services upon request. Real Player is required to listen to audio files on this page. Click Here to get a free copy. *Copies of these pages are available to the public by mail or at the Visitor Information Desk on the first floor of the Capitol. The Americans with Disabilities Act prohibits discrimination on the basis of disability. Title II of the ADA covers all activities of state government, requiring that state government programs, services, and activities be provided to and accessible by individuals with disabilities. As part of state government, the Louisiana State Capitol is required to provide an equal opportunity to persons with disabilities in an integrated setting, unless separate or different measures are necessary to ensure equal opportunity. Thus, the services described in this manual have been formulated to achieve the most integrated setting possible. Listed herein are the various types of auxiliary aids and services provided by the Capitol. When an auxiliary aid or service is requested, primary consideration will be given to the type of aid or service requested by an individual. Some services require advance notice. To make a request for services, please refer to "Procedure for Requesting Disability Services." Requests for disability services information or requests for any service listed in this manual may be made by telephone or at the Capitol. The following is a list of locations that can be accessed to request any service listed in this manual. ADA Coordinator - State Capitol Louisiana House of Representatives P.O. Box 44486 Baton Rouge, LA 70804. The coordinator can be reached by telephone at (225) 342-0367(voice) or for TTY, (225) 219-4688 or (888) 850-6489. For general inquiries regarding state disability services, please contact the Disability Information Access Line at (800) 922-3425, or visit the web page for the Louisiana Developmental Disabilities Council at http://www.laddc.org. Braille printed documents and bill drafts are available at the Capitol both in Grade 1, which is letter for letter printing, and Grade 2, which uses contractions for letters often used together. Requests for Braille printed materials should be made 48 hours in advance and should specify the grade desired. Requests for lengthy materials may require additional time. The cost of Braille printed materials is 25 cents for two pages of Braille. If the bill is mailed, a minimum postage charge of $1.50 will be added. Written materials and bill drafts are available in large type print. Standard large print is 18 point. Requests for large type print should be made 48 hours in advance. The cost of large type materials is 25 cents per page. Faxing is $1.00 per page, and there is a $1.50 minimum postage charge on any bills mailed. Bill Status information is available by telephone at the Capitol by calling any of the following numbers: (225)342-2456 or (225)342-0769 in Baton Rouge or (800)256-3793 or (800)868-3178 statewide. Inquire at the Visitor Information Desk. A Tour Guide can be requested at the Visitor Information Desk. Sign language interpreters are available for programs and proceedings at the Capitol, including but not limited to committee meetings and floor proceedings. Interpreters are also available to accompany tour guides for tours of the Capitol. There are different types of interpreters, and the Capitol will provide the type requested by the person who is deaf or hard of hearing. Requests for interpreters should be made 48 hours in advance and should specify the type of interpreter desired. Every attempt will be made to accommodate requests made with shorter notice. Portable infrared receivers with headphones are available for use in the House and Senate committee rooms and in the House and Senate Chambers. Requests for use of an assisted listening device should be made 1 hour in advance for committee rooms, and headphones will be distributed in the committee room. No advance notice is required for Chamber proceedings. Headphones for Chamber proceedings are available from the Sergeant at Arms Desk. The Capitol provides TTY hotlines for individuals who are deaf or hard of hearing. The phone numbers are (225)219-4688 in Baton Rouge or (888)850-6489 statewide. The numbers connect directly to the PULS line. PULS line staff have been trained to answer calls regarding bill status information as well as disability service information. The Capitol is equipped with TTY pay phones. Review the Map of the Capitol for specific locations. 1. These steps should be accomplished before logging on to the Louisiana Legislature page. Make sure that Flip for Mac is updated to the current version. 2. From System Preferences, Select the Flip for Mac WMV preferences window. 3. Press VO+space on the browser tab. 4. Now, VO+right until you hear, "Launch Quick Time player". This will be unchecked by default. Check it by pressing VO+space. 5. Now, exit the System Preferences window. 1. Log on to the House Video page as usual. 2. Interact with the bottom frame. 3. Note the active rooms and choose which witch to watch by pressing VO+space on the "VIDEO" link on the House website. 4. At this point, Quick Time will pop Open. A dialog will appear briefly saying "loading movie". When the stream is loaded, it will begin. NOTE: These instructions ONLY work with Safari. Firefox or any other browser interact with VoiceOver differently, but with less functionality. Wheelchair accessible entrances are located on both sides of the Capitol. These entrances are equipped with automatic doors. Review the Map of the Capitol for accessible routes. A video of the Capitol has been produced which shows the highlights of the Capitol and a view from the observation tower. 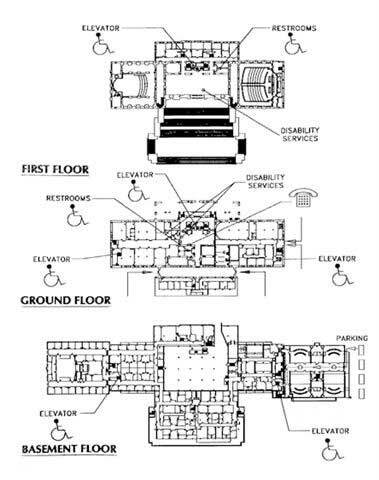 Wheelchair accessible elevators are located on the ground floor. Review the Map of the Capitol for specific locations. Wheelchair accessible telephones are located on the ground floor and in Alario Hall. Review the Map of the Capitol for specific locations. Please visit the official websites of the Louisiana Legislature at legis.la.gov, house.louisiana.gov, and senate.la.gov All of the information contained in this manual as well as general information pertaining to the Louisiana Legislature may be found on the websites. For general inquiries regarding state disability services, please contact the Families Helping Families Regional Resource Center at 1-800-922-3425, or visit the web page for the Families Helping Families Regional Resource Center at www.laddc.org/Initiatives.cfm?aid=6&id=9. The coordinator can be reached by telephone at (225) 342-6146 (voice) or for TTY, (225) 219-4688 or (888) 850-6489. This Grievance Procedure is established to meet the requirement of the Americans with Disabilities Act. It may be used by anyone who desires to file a complaint alleging discrimination on the basis of disability in the provision of services, activities, programs, or benefits by the Louisiana State Capitol. The complaint should be in writing, and contain information about the alleged discrimination such as name, address, phone number of complainant and location, date, and description of the problem. Alternative means of filing complaints, such as personal interviews or a tape recording of the complaint, will be made available for persons with disabilities upon request. Within 15 calendar days after receipt of the complaint, the ADA coordinator will meet with the complainant to discuss the complaint and possible resolutions. Within 15 calendar days after the meeting, the ADA Coordinator will respond in writing, and, where appropriate, in a format accessible to the complainant, such as large print, Braille, or audio tape. The response will explain the position and offer options for resolution of the complaint. If the response by the ADA Coordinator does not satisfactorily resolve the issue, the complainant and/or his/her designee may appeal the decision of the ADA Coordinator within 15 calendar days after receipt of the response to the Clerk of House of Representatives and the Secretary of the Senate. Within 15 calendar days after receipt of the appeal, the Clerk of the House or the Secretary of the Senate, or a designee appointed to represent either individual, will meet with the complainant to discuss the complaint and possible resolutions. Within 15 calendar days after the meeting, a response will be made in writing, and, where appropriate, in a format accessible to the complainant, with a final resolution of the complaint. All written complaints and appeals received and all responses thereto will be kept by the Louisiana State Capitol for no fewer than three years.